A feasible region is a shaded region on a graph that covers all possible coordinates that satisfy the inequalities. An objective function is used to describe a quantity that provides the greatest value. It can be a value that is aimed to be large (for example, profits) or it can be a quantity that is preferably smaller (for example, the amount of paint needed to paint a house). Either way, it is used to maximise the benefits of a function, given certain constraints. In order to maximise or minimize the objective function, the extreme points are often found. These are the ‘corner’ values. This is because the maximum (or minimum) possible objective function often lies on one of these points. 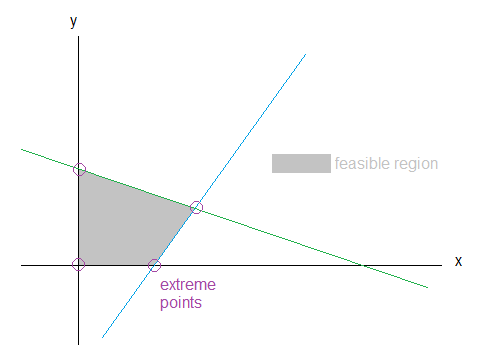 When the feasible region is sketched, the extreme points can be found by finding the intersections between the relevant equations. The coordinates of the extreme points can be substituted into the objective functions in order to identify which point gives the appropriate maximum/minimum.